Denny Jump (Bellevue, WA, United States) on 8 March 2014 in Landscape & Rural. A little cold - but oh, so beautiful. I captured this just steps from my house. This little bench sits on a walking path for our condo complex. was processing this in Snapseed.. Excellent play between the shadows of the trees and the ones of the bench ! I like that glimpse of 'forever' at the top to remind us there is so much more than here and now . . Superb. To me, the light on the upper edge with the shades makes the picture. Sweet light. The bench makes a nice focal point. You might freeze your backside if you sit there too long. Love that warm light. such beautiful warm lighting & shadows! Gorgeous image! 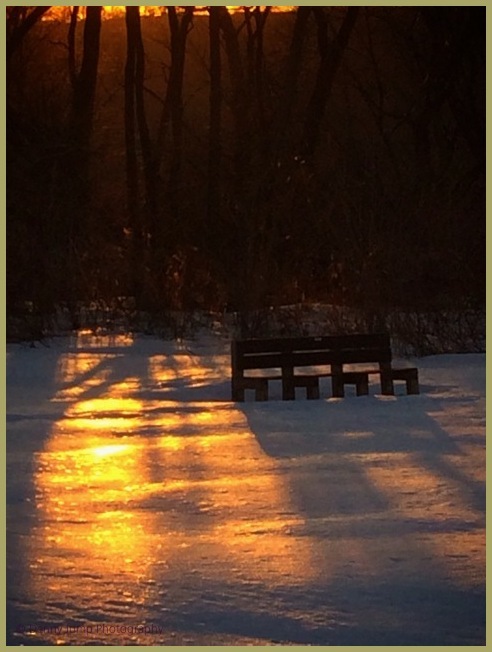 I love the empty bench and the beautiful light! A wonderful poem!